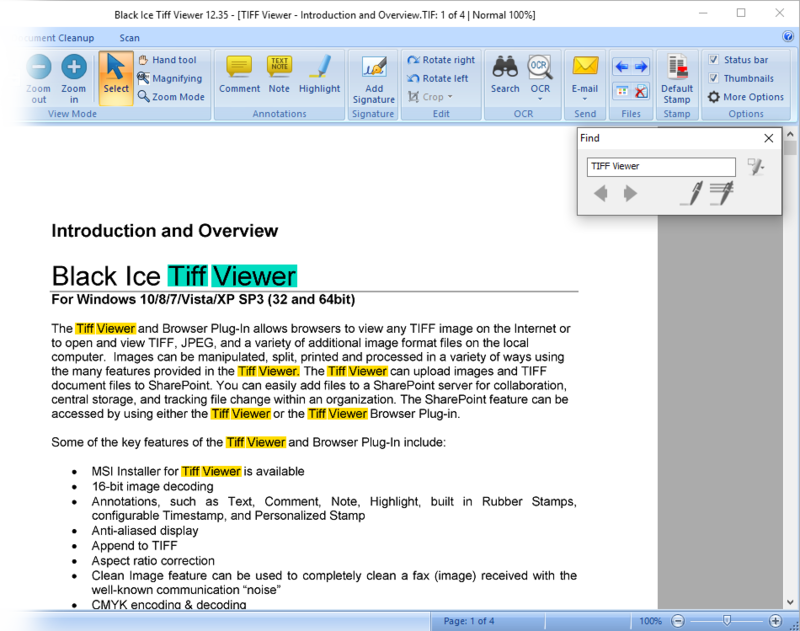 The Tiff Viewer offers text search capability to easily and quickly find text within Tiff Images. One can start the Search by clicking the Search icon in the Home ribbon of the Tiff Viewer. By clicking the Search icon, the Find window will open to type in the text to search for. Press the Find button to start the Search. The Search function uses Optical Character Recognition or OCR in the background to locate text within the images. The OCR process is performed the first time the search is used on the document. The result (text from the images) is saved in memory and can be used or subsequent searches. Once the document is closed the OCR data for the search is deleted. Please note that if a user perform the OCR function on a document, the result is a text file opened in the default Text file viewer. It is possible to use the ‘*’ - asterisk and ‘?’ - question mark wildcards in the Search field. When using the asterisk in a word, the Search function will match any number of other characters in its place. For example, searching for “int*” will include results for internet, introduction, intact. When using the question mark in a word, the Search function will match exactly one character in its place. For example, searching for “op?ion” will include option. After starting the search users can highlight or redact text, that the search resulted. When selecting Highlight option in the search dialog, users are allowed to highlight current search result, marked with turquoise, or to highlight all search results, marked with yellow. When selecting Redact option in the search dialog, users are allowed to redact current search result, marked with turquoise, or to redact all search results, marked with yellow.